Double Points: Nero, At UCSB’s Campbell Hall. Double Points: Nero, presented by Emio Greco | PC. At UCSB's Campbell Hall, Tuesday, April 17. 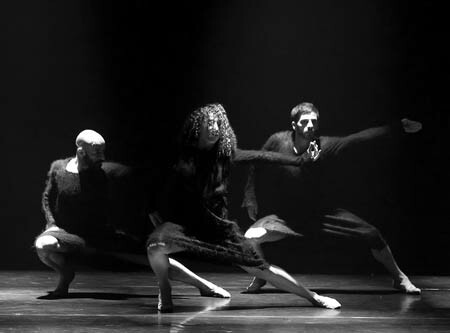 Curly-headed and languid-limbed dancer Suzan Tunca was often featured downstage, her movements mirrored by Nicola Monaco. In Double Points: Nero, things are never quite what they seem. A woman seems to dance alone, when in fact her every move is mirrored by a figure obscured by smoke. Dancers make dramatic exits, only to reappear immediately. A quiet, tender solo ends abruptly, replaced by crashing electronic noise and anxious racing. Even the lighting obscures as much as it illuminates. All these ambiguities might be interpreted as manipulative, except it’s obvious they originate, instead, in hyper-sincerity. There’s something compulsively innocent in the way Suzan Tunca felt the space around her, wheeling her arms in the smoky air, testing the space with her head like an eyeless creature emerging from a hole in the ground. There’s something primordially exposed in the way Emio Greco’s head wobbles at the top of his spine, his jaw working, his eyes returning again and again to the audience. These artists appear to have trained themselves to forget, while onstage, at least, that they are civilized. They grunt, bolt in fear, and curl up together, seeking warmth. Mostly, they are driven by an urgency, the source of which remains mysterious. Dressed in identical black woolen sheaths, they are like monks, but also like monkeys-stripped down to austere basics, but possessed of a disarmingly primitive abandon. And yet they are exquisite dancers, and their movements are all choreographed, rehearsed, and technically controlled. There’s a recurring theme of mirroring, often in two planes, so that a figure lying on the floor echoes the movements of a standing figure. Sometimes this mirroring seems involuntary; the standing dancer is a voodoo doll, the prostrate one, the hapless victim. It’s impossible to discuss the company’s work without mention of the lighting design, yet even to refer to light as “design” is to negate its fundamental presence as a creative force on the Greco | PC stage. In Double Points: Nero, light pursues dancers, it blinds the audience, it illuminates the smoke filling the stage space, and brings to life every square inch, shifting in a split second to the scrim and wings, suddenly containing the dancers in an empty, padded box. The invisible creative force here is Pieter Scholten, Greco’s collaborator and a visionary theater director. How exactly the two work together, like the work itself, is a mystery, but the results have extraordinary power. And that’s not just a trick of the light.